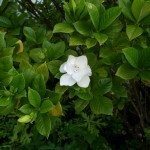 My gardenia plant has a white, powdery substance around the buds, which are not blooming and subsequently dropping off. Leaves are green and shiny and new leaves are appearing. Some leaves have holes in them. What to do?